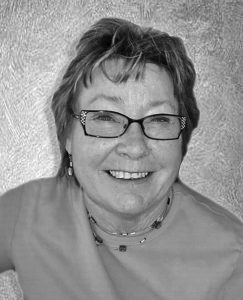 Kathy Dianne Otter, 70, of Faulkton, passed away Friday, July 13, 2018, at the Faulkton Area Medical Center from cancer. Funeral services were held Wednesday, July 18, at Concordia Lutheran Church, Cresbard. Burial followed in the Oakland Cemetary, Seneca. Visitation and prayer services were held Tuesday, July 17, at Luce Funeral Home in Faulkton. A fellowship gathering at the community center in Faulkton followed. Luce Funeral Home of Faulkton was entrusted with Kathy’s arrangements. Kathy Dianne Dahme was born July 2, 1948, in Faulkton to Roy and Lillian (Emmons) Dahme. She was the youngest of 13 and attended school in Faulkton School. On June 30, 1968, she married the love of her life, James Marvin Otter. Together they raised five children. They farmed in the Cresbard area until moving to Faulkton several years ago. Kathy was a dedicated wife and mother. She was very active in many clubs and organizations. She was a member of the Cresbard Ladies Auxiliary and a 4-H leader from 1982-2000. She held many offices in the Faulk County Saddle Club, Broncos 4-H Horse Club and Faulkton Area Arts Council. Kathy was a member of Concordia Lutheran Church in Cresbard and active in LWML. Kathy is survived by her husband, James; children, Rebecca (Brad) Lewandowski, Raechel Otter, Joseph (Tracy) Otter, Jessica (Matthew Allen) Otter and Jonathan (Emily) Otter; two brothers, Terry (Pat) Dahme and Roger (Doris) Dahme; one sister, Carol (Philip) Geist; 11 grandchildren; and many nephews, nieces, cousins and beloved coffee friends. She was preceded in death by her parents, Roy and Lillian Dahme; brothers, Den-nis, Gerry and Bruce; sisters, Rita, Keo, JoAnn, Peggy, Linda and Donna; and infant granddaughter, Isabella. Memorials can be made to the Oakland Cemetery; c/o Rolland Potter, 201 Elm St., Seneca, S.D. 57473.